Ocean Noise affects the marine life in all our oceans. Anthropogenic noise is human-generated sound from various sources including commercial ship traffic, oil exploration and production, construction, acoustic research, sonar use and navy experiments. Noise causes health problems for all life yet when it comes to the life under the surface of our oceans we tune a deaf ear to it. Hydrophonia's goal to raise public consciousness about anthropogenic noise and the devastating effect it has on the delicate balance of our planet. One way sound artists can help is to create new sound works using the very noise that is negatively affecting the marine life in our oceans. Hydrophonia is therefore inviting sound artists to create a new work using a library donated generously by the renowned bio-acoustician and field recordist Gianni Pavan of CIBRA in Pavia Italy. NOTE: These recordings have been approved for use in this contest ONLY. Please do not use them in your independent works. The creator of the files, Gianni Pavan, has not granted permission for public use. Please contact the owner at gpavan@cibra.unipv.it for permission before using these for anything else. - all submissions should be sent as 192 kbps mp3 files! - please do not send .wavs or .aiffs! - they will not be accepted unless specifically requested! 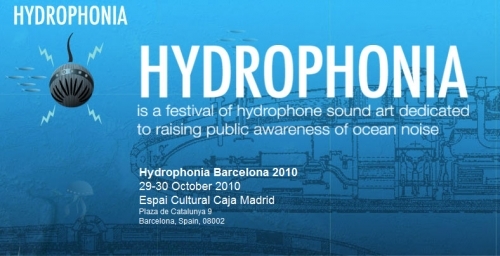 NOTE: These recordings have been approved for use in the Hydrophonia Sound Art Contest ONLY. Please do not use them in your independent works. The creator, Gianni Pavan, has not granted permission for public use. Please contact Gianni at gpavan@cibra.unipv.it for permission before using these for anything else. Thanks!